I'm not incredibly familiar with Barry M nail polishes. In fact, this is only my second polish by them - surprising, as they're so cheap and come in an amazing array of colours and glitters. A few weeks ago I picked up the Pink Sapphire Glitter polish. I have plenty of glitters in my collection, but none like this. It's a mixture of pink and holographic chunky hexagonal particles, with smaller pieces of pink glitter and holographic strands (or bar glitter) in a clear base coat. 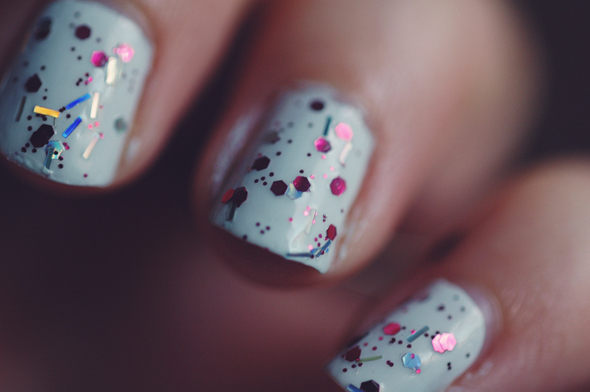 I really like colourful glitters over white, so my base of choice was OPI's "My Boyfriend Scales Walls." The above picture shows two coats - one is enough, but I wanted a tad extra sparkle. As with a lot of glitter polishes, the larger chunks do need a bit of repositioning on the nail so they don't cram together, but this wasn't much of a problem for me. The drying time is average - not super fast, but not painstakingly slow either which is great for the impatience in me. Pink Sapphire Glitter is part of the Barry M Jewel Glitter range, which consists of 7 polishes perfect for the party season, and retail for £2.99 each in both Boots and Superdrug. What do you think of this polish? I love it! 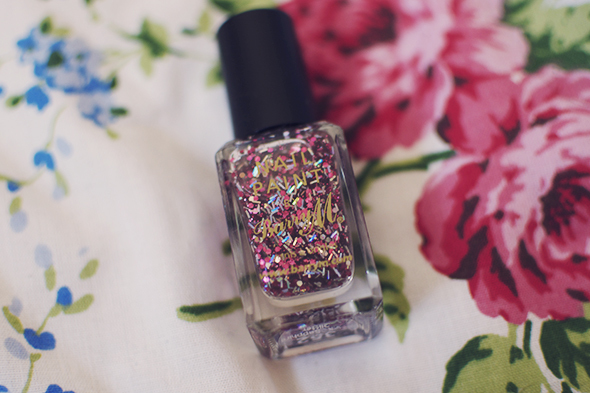 I love this nail polish! Barry M is such good quality at an affordable price! Looks so gorgeous with that blue colour! I have a few Barry M's but I find the normal range polishes take a long time to dry and I'm so unbelievably impatient that I avoid using them now. The glitter ones may be different though so I might have to give them a go. Thank you :) It's definitely worth grabbing a few, especially if they're on 3 for 2! I love this, the mixing of textures of the glitter is gorgeous! Aww so cute and merry for Christmas! It's so festive, reminds me of tinsel! I absolutely adoreeee barry M nail varnishes- when I used to work in Boots I spent a fortune! I have recently started my blog, fashion and beauty related, and have just done a 'caviar' 4D nail review, would love you to take a look!